At the urging of my 8 year old daughter I've expanded the Labyrinth mini-set. What once was but five cards is now is now sixteen! She was right though. Too many great characters in the Goblin Kingdom to stop at five. Lately I've been into making multi card sets. Whether it's something new or adding another card to a set I've previously created. At first I avoided anything where there wasn't a hope of getting an autograph, but I've found that it's fun to make cards of what are often times the main character of a movie or show. That brings us to this five card set. 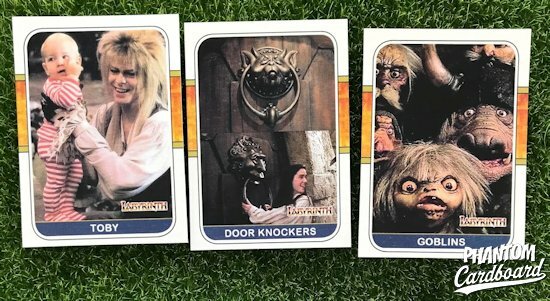 It's hard to believe that Labyrinth never had a mass produced card set. 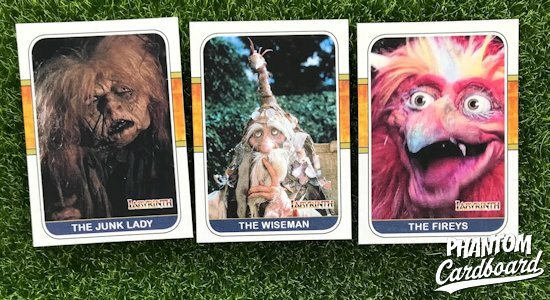 You would think that it would be very marketable as a trading card set being that it was a Jim Henson creation with muppets and all, not to mention David Bowie and Jennifer Connelly. The glass half full of there never being cards for it is that 31 years after it was released in theaters it gives me an excuse to create a few cards of one of the '80s biggest fantasy / adventure movies. 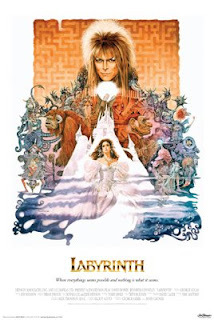 For some reason I was under the impression that Labyrinth came out in 1987. I guess I assumed because it seemed like an '87 movie. What I mean by that is that soooo many awesome movies came out that year. As a sidebar if you ever get a chance check out all the movies that were released in 1987 and also 1984 you'd see that those two years housed a majority of the decade's best movies. 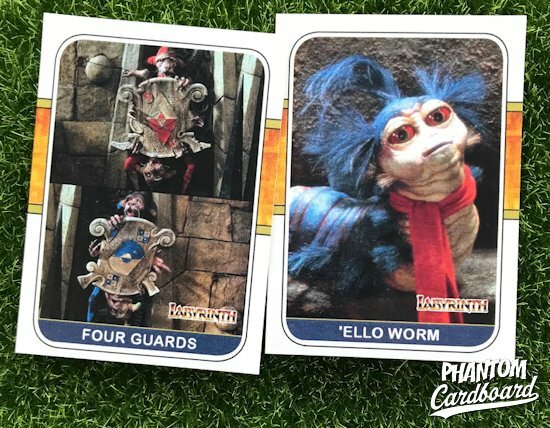 Being that I mistakenly thought Labyrinth was released in 1987 when I hatched my idea to make cards for it I had already decided that I was going to use a 1987 Donruss baseball inspired design and how I wanted to cards to look. Then I did a quick check and discovered that I'd overshot my mark by a year. 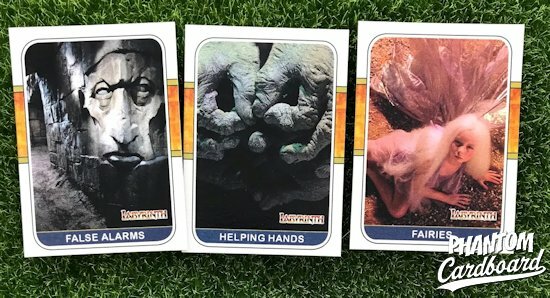 If you follow this blog you know that I like to pair the year of the card design to the subject's release year or debut. 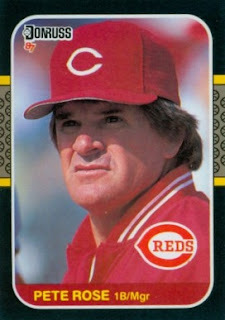 I was already committed to what I wanted to do when I picked the 1987 Donruss design so there wasn't any turning back once I envisioned how these cards were going to look. I did ever so briefly contemplate other card designs from 1986 but I just felt the '87 Donruss' layout best fit my vision and would make the most sense. In my mind I was picturing the movie's poster and drawing inspiration from that. I've always been a big fan of movie poster art. Posters from artists such as Drew Struzan, John Alvin, and Richard Amsel to me can be as iconic as the movies themselves. I chose to go with a white border as opposed to the 1987 Donruss' black border to go along with the large portions of negative white space on the poster. The gold colored borders are also meant to coincide with the poster's pallet as well as the blueish-purple colored nameplate. The color's placement locations are meant to mirror the poster's color progression. I borrowed the labyrinth illustration from the poster to go in the place of the baseball trim that runs through the center of the card. The baseball cards featured a team logo in the lower right corner so I completed the card with the movies font title in the form of a logo. I've started with my five favorite characters from the movie but I'll update this post if I add other characters. Just brilliant. The design complements the pictures well. Thank you. This is one I plan to expand in the near future. Oh, yeah. "The Bog of Eternal Stench" beckons!